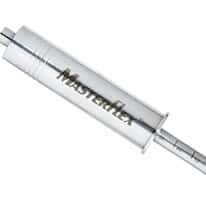 Syringe pumps either draw in or push out liquid through a syringe to obtain a known volume as determined by the size of the syringe. You can depend on us for a wide selection of syringe pumps from low-flow, low-pressure applications, where precision is needed, to robust, high pressure models ideal for fluid delivery to reactors in chemical applications or for working with viscous fluids. Select pumps are available with user-friendly touch screens to help you work more efficiently.